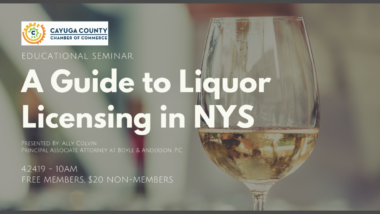 This seminar is for you if you’re interested in starting a business where you’ll want to serve alcohol to the public or if you’ve had questions about the NYS Liquor Authority. Presented By: Ally Colvin, Principal Associate Attorney at Boyle & Anderson P.C. Ally Colvin received her Juris Doctor from St. John’s University School of Law in 2012 after graduating from Syracuse University in 2009 with a Bachelor of Music in Music Industry in 2009. In 2011, she joined Helbraun & Levey LLP, a boutique law firm in New York City specializing in assisting those in the hospitality industry, where she rose through the ranks from law clerk to associate attorney and eventually partner in 2018. She has experience in advising small businesses on real estate, corporate and administrative law issues. Ally is a native of Auburn, New York, and is excited to return to the area to serve her community.